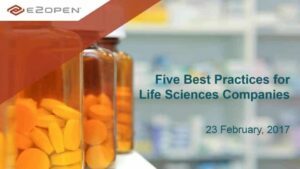 Five Supply Chain Best Practices for Life Sciences Companies - E2open | Demand. Supply. Delivered. Supply chain management is playing an increasingly important role for the pharmaceutical industry – an industry that is facing new cost, performance, and quality issues. In this webinar, Patrick Lemoine, VP of Product Marketing at E2open, addresses five best practices you should start looking into if you haven’t already to tackle these challenges.